Picture: David at CV 2004 Kids Champion on a standard M5 Shock Proof! Like every year M5 riders performed excellent during the international event Cycle Vision in Zandvoort, the Netherlands. Bram Moens: third in the one hour race, unfaired, on a Low Racer with Tail Fairing. 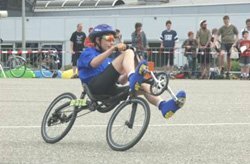 Marc Tauss: third in the 300 metre sprint on a Low Racer with Tail Fairing.